Racism is discrimination and prejudice towards people based on their race or ethnicity. It is widely condemned throughout the world, with 170 states signatories of the International Convention on the Elimination of All Forms of Racial Discrimination by 8 August 2006. 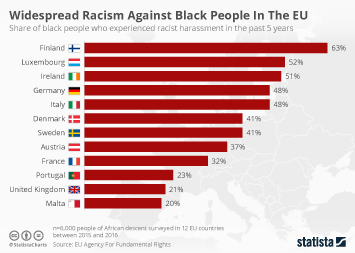 Racial tensions have always existed in the Western context, but they became a threat to stability in the European Union in the last years, reaching peaks of racial bias in countries like Italy, the Czech Republic and other Eastern European nations. In the United Kingdom, the share of respondents saying that they were, at least to some extent, prejudiced when it came to people of other races peaked in 2011 and showed a trend of increase in the last years. In 2016, the majority of Norwegians surveyed expressed concern about growing xenophobia and hostility toward immigrants and refugees. Physical and verbal racial violence increased over the last decade in most European countries. In Italy, for example, 25 cases of racial physical violence were registered in 2014 plus a total of 916 cases of racial verbal violence. In 2014/15, the number of racist offences registered in Northern Ireland peaked at a total of 310 offences including violence but not injury. Race is the most common motivation of hate crimes: between 2015 and 2016 around 13.4 thousand racially motivated hate crimes were recorded in London. In 2015, 68 episodes of physical assault were related to hate crime in Italy. Episodes of hate speech are on the rise. In Italy, a daily average of 0.48 episodes per day of hate speech against Roma and Sinti were registered in 2016, while 55 percent of French males were exposed to racist statements online in 2015. As a matter of fact, most French people believe that posting content on the internet anonymously encourages hate speech. Five percent of Swedish Internet users stated that they often accidentally encountered material which promotes racial hatred online, while only three percent of Finnish users often experienced such situations. Would you describe yourself as very prejudiced/a little prejudiced against people of other races? To what extent do you agree or disagree with the statement: "British people of all races generally get on well"? To what extent do you agree or disagree with the statement: "violent conflict between the white majority and ethnic minorities in Britain is largely inevitable"? To what extent do you agree or disagree with the statement: "Muslims are compatible with the British way of life"? To what extent do you agree or disagree with the statement: "Differences in culture and values make future conflict between British born Muslims and white Britons inevitable"? To what extent do you agree or disagree with the statement: "there will be a 'clash of civilizations' between British Muslims and native white Britons"? Do you agree or disagree that Scotland would begin to lose its identity if more black and Asian people came to live here?